QCppUnit is seriously obsolete. It was written in 2001 for KDE 2 with Qt 2. It won't run with recent version of Qt or KDE. Nowadays, if you need a good unit-test framework for C++, I strongly suggest to use GoogleTest which has every quality I expect from a good unit-testing framework. 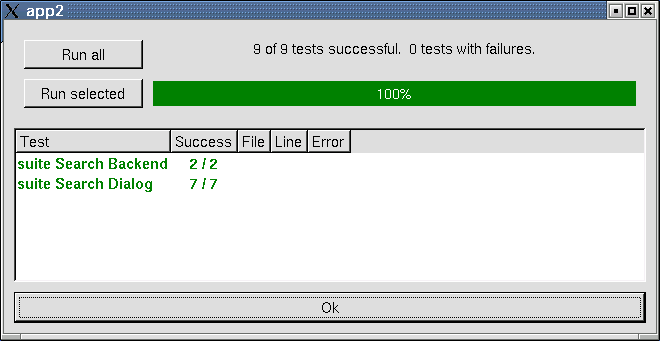 QCppUnit is a framework to perform unit testing, as described for example in Extrem Programming (www.xprogramming.org ). This framework uses Qt to display the result of the tests and contains an example that show how to test a Qt application, even on user behaviour. 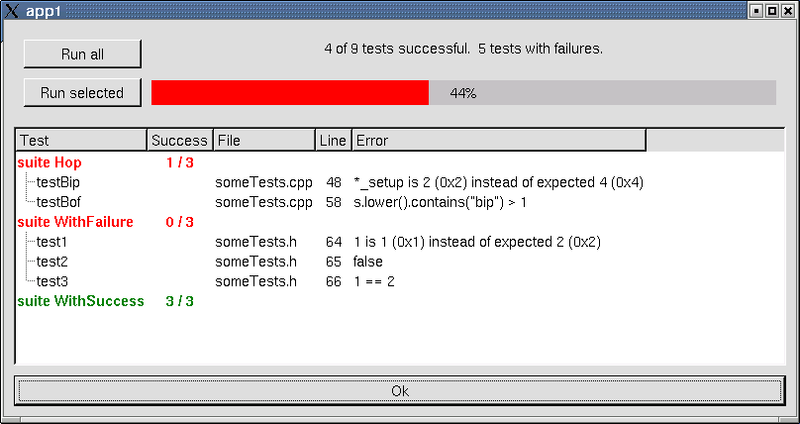 I took the C++ Unit test suite (called CppUnit) of one of the Extrem Programming site and ported it to Qt. My addition is the Qt Gui front-end, that runs under Unix and Windows. The testing framework itself has not been modified a lot, and I'll try to reverse the changes to have really just a Gui frontend. What is cool with Qt is that you can test the interface of your application easily. No need for some clever replaying mechanism. Check the example 2 directory to see a real-world example. A manual describes how to use this test framework here. Two examples are provided in the package. For the second example, I have included a long explanation of how I tested a Qt dialog. Read it , it should be clearer than any manual. I have been using the testing framework on Windows extensively but I hadn't written the Gui for it at that time. And I am on Linux now. So this framework works sure on Linux with Qt2. Use the Makefile, the testing framework should build without problems. Include it as is in your application (see example2 for real-world example). I'll release a clean Windows version as soon as I get back to Windows. Probably somewhere in january 2002. I haven't compiled Qt3 yet but porting my 450 lines dialog should be no problem. I estimate the time needing to port to Qt3 to 10 minutes. I'll do it as soon as I have compiled Qt3. Somewhere in december 2001. The framework should work without problem although it is Qt based. You don't really care if the dialog is Qt or KDE, because this test suite is only a thing you use in the development process, not something you release to the final user. You might want to change the qDebug(debugStuff) to kdDebug << debugStuff if you use setDisplayDebug(true). Since KDE3 = Qt3 + KDE2, see the relevant previous paragraphs. Qt3 runs on Macos X, so should this framework. I can't test it though. Tell me if you use it on Mac OS X.
LGPL. So yes, you can use this with your proprietary, closed source, commercial, evil application :-). Beware of the Qt license though. If you don't pay for Qt, you are either with Non Commercial License, GPL or QPL. And remember, there is no warranty of anything, not even the idea that your application might not work better if you don't use this. you run your test : it fails! you run your test : it runs! if you break any other test, you fix it. In Extrem Programming, you do this for every feature. This sounds a bit long and complicated at first glance, but when you have a 30000 lines project, and you must change some core feature that is used everywhere with two levels of indirection (understand : you don't see the result of the change directly), you are glad to have your 300 tests that will report any unexpected behaviour modification. I give a real-world example in the example2 directory of how to use this testing suite. This page was last edited on 2 December 2014, at 00:55.